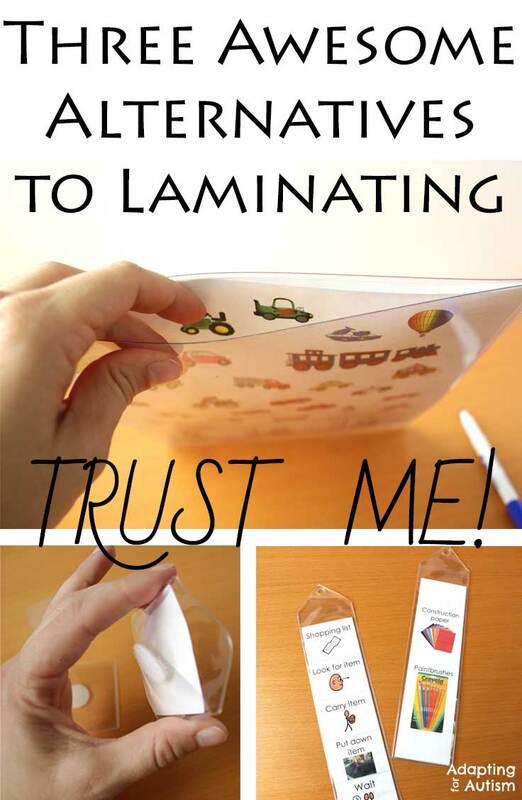 Stop Laminating Everything in your Classroom! 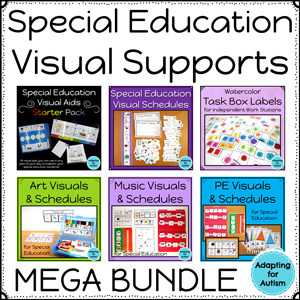 Share for your fellow special educators! Stop laminating? In my special education classroom? But what about my beautiful task cards and adapted books? Kids with autism are rough on my materials – nothing will last past one station! So I’m not saying you shouldn’t protect your materials. I’m just saying there are better, more eco-friendly and cheaper options available! In your quest to limit your laminating, these are literally your best friend for 2 reasons. 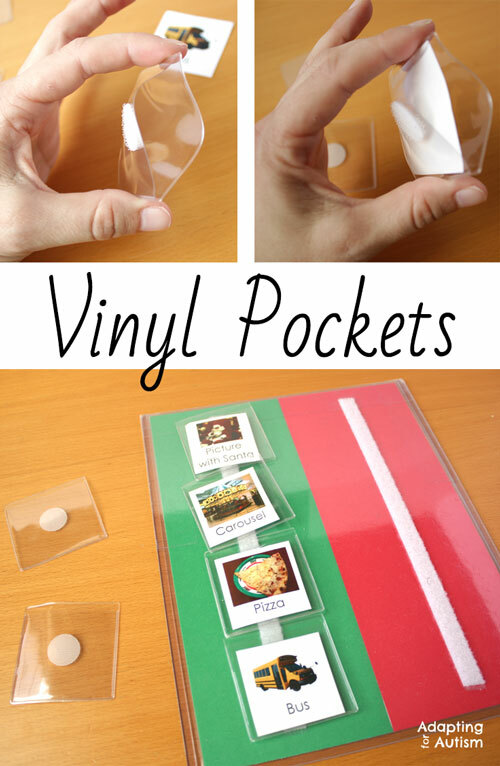 First, you can make something durable without laminating. This is perfect for one time icon needs. You know there are plenty of times you make icons or schedules only to throw them away immediately. Or perhaps you store them until the end of time because that’s what teachers and therapists do (because you just. never. know), but you never actually use them again. Second, you know how you need a reinforcer icon NOW and the laminator is down? DEFCON 5. Might as well call it a day and grab yourself a weighted blanket to hide under. I always make my icons 2 inch squares but they can accommodate a slightly larger piece (2 1/8″). There is a minimum order but I had no trouble meeting it by purchasing these and the bookmarks (see below). Otherwise, find another teacher or therapist and convince them they need these pockets in their life too! These are in competition to being your best friend right behind the above mentioned pockets. You can of course use page protectors, but these are incredibly sturdy. They have a little flexibility to them but not much. My kids take papers out of page protectors, but for some reason they leave these alone. Perhaps they don’t realize it’s open at the top? Being a recreation therapist, my activities change daily but I need them to be durable because I have 4 back to back classes coming to use them. So I could laminate my BINGO and spinner games and make my wildlife biologist sister cry. Or, I could slide my activities in these amazing pockets and simply wipe them clean between classes. Bonus: you know how as soon as one of your kids wrinkles your beautifully laminated paper, dry erase markers do not wipe off clean? Not so with these. Seriously. I have the same set from over 5 years ago and they look brand new. Like I said, I use these for activities like Coins BINGO, Articulation Find It Games, fine motor worksheets etc. I also use them for my schedule. 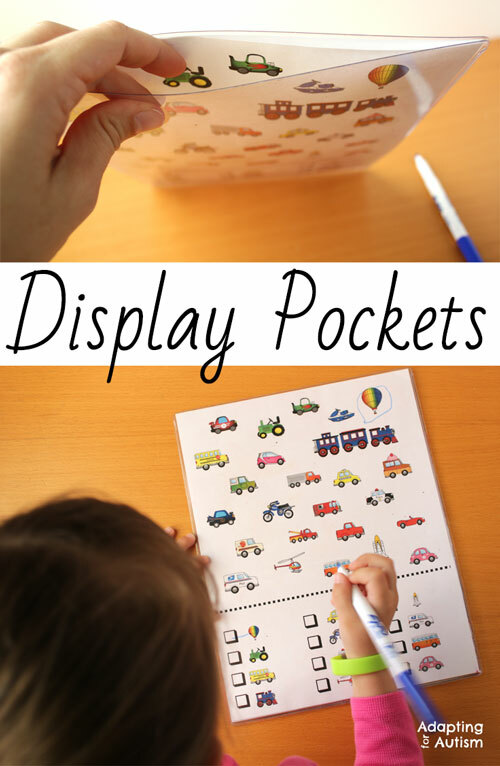 I always break down the steps for the whole 30 minutes, but my students do not necessarily need individually cut out icons (on the rare occasion they do, I use the pockets). And I’ve never once repeated a schedule so there’s no need to trap it in plastic until the end of time. Most of mine are from Trainer’s Warehouse linked above but I know some schools have approved vendors so these 3M Display Pockets from Amazon are similar. I have both kinds and these work too, they’re just a little flimsier. These are the solution to your task analysis and mini schedule needs. The ones I have are 2 inches by 8 inches with a hole punched in the top. I like this version because I can use a binder ring and keep them from getting buried in my bag on community trips. You can also hang them on command hooks for easy access. These from Amazon are about 1/2″ shorter than what I have but they don’t require a minimum purchase. I use these primarily for community trips but there are limitless uses. Our shopping list changes every time we go out, but I can’t just hand them a piece of paper. The smaller size also allows paras to shove them in their pocket when they need both hands available. I have a simple template in Word that I use every time. One side is the shopping list (simply copy and paste from Google Images). The other side is a mini schedule of sorts. 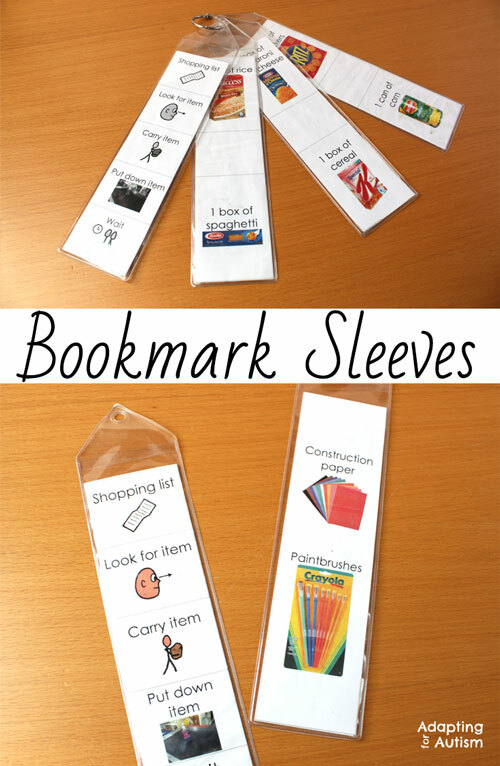 I print, cut, fold it in half and slip it in the bookmark. Ready to go! Students have their visual aids and I have saved my laminating sheets. I am not anti-laminate; I know many of our tasks are used day after day and year after year. Those absolutely should be laminated! But hopefully you can use these tools for items you don’t use frequently! Do you have any other hacks for making your materials durable? I would love to get some of these but cannot find them on the Trainers Warehouse Website. Please provide a link as I am not seeing it. You have some wonderful ideas and resources!